Greetings, dear readers! I hope this post finds you well and you have been having a wonderful week thus far. As for myself, I've been putting in extra hours at work, and I am really feeling it already! I'm a little worn out and hoping both my kids opt to take a nap today so I can get one myself! Ha! 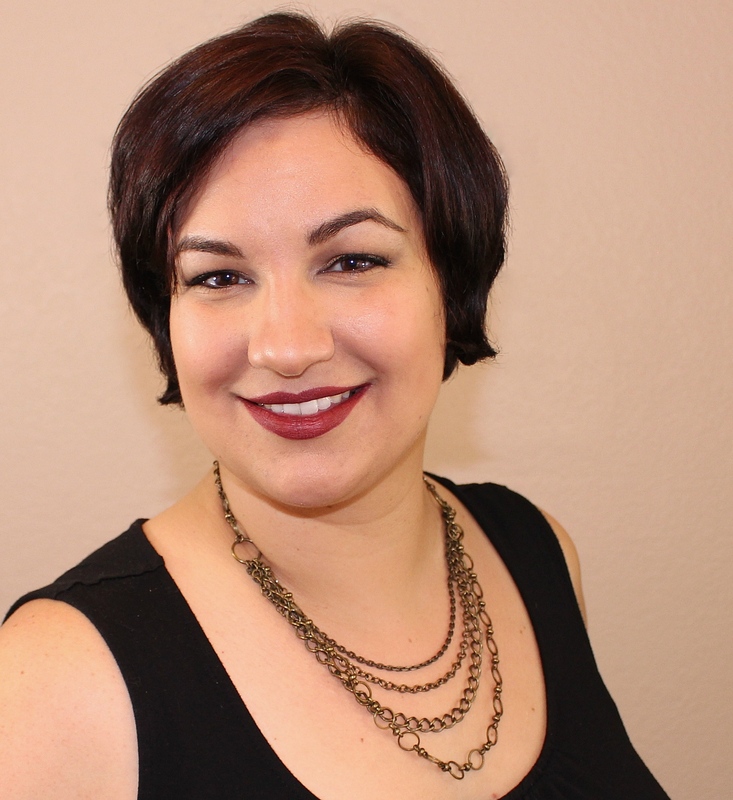 Now to cut the chit chat short and jump in on today's blog post! I've really been missing out on doing nail art as often as I used to, and I am so thankful to have Born Pretty Store both challenge and inspire me! Their nail art supplies are fun and affordable; what could be better? One of the latest items I have received to review is this cute space-themed plate. I love that the variety on this plate includes different planets and asteroids, and how cute is the little alien! I was definitely eager to give my nails some out of this world treatment, and this plate was the perfect accompaniment to my nail art design. Check it out! This particular nail art design really allowed me to test out the etching of many images on this plate! I don't always have the opportunity to do so, and I was really happy to actually try these multiple images out on my nails! As you can see, I utilized the traditional stamping technique as well as reverse stamping. I was really pleased with how deeply etched these images were, and I had no issues with picking up very crisp images of my stamping polishes onto my stamping head! I really enjoyed trying out this plate! 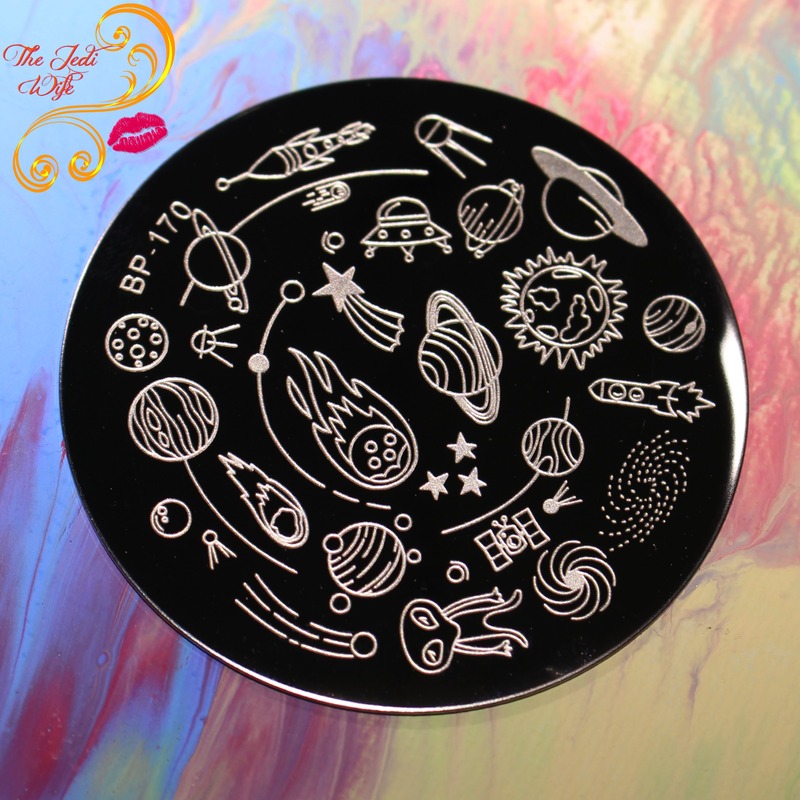 If you are interested in stamping nail art techniques and outer space, this plate is definitely for you! It is also very affordable at $2.99 at full price, and at the time of this post, it is marked down to just $1.59. Now that's what I call making a good deal even sweeter! The direct link to this plate can be found here. While you are shopping at Born Pretty Store, you can save 10% off full-priced items with discount code QWL-91. They have so many fun things to choose from so be sure to stock up on your next order for all your upcoming nail art needs! Have you used this particular stamping plate? 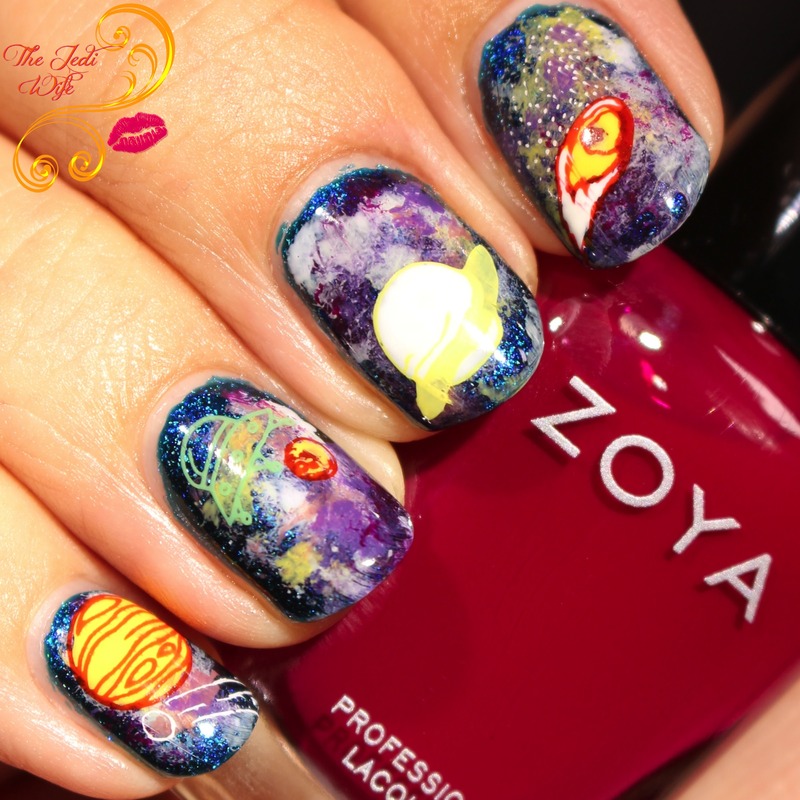 Would you enjoy sporting space-themed nails? I'd love the hear from you! Holy moly!! I love this so hard! Wow, beautiful nails. My daughter would love the solar system decals. I really like this plate but I really love that it's deeply etched. I bought plates from another brand and just cannot pick up a crisp image to save my life and I think it's because it's got shallow cuts. So annoying! are there stickers on the plate? i'm confused as to how it works? How do you get the design to the nails? This turned out so cute! I really need to pick up this plate. Your nails look amazing! how detailed and pretty! 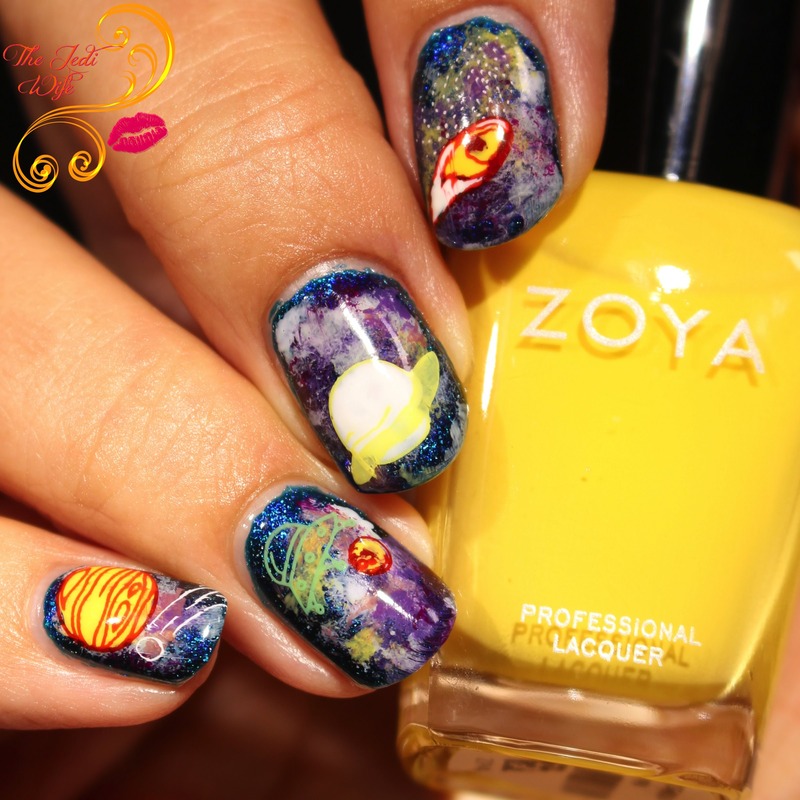 And this galaxy design is lush! These are too cool! I always love unique nails and these are it. What pretty colors! This is such a fun manicure! Beats me how you stamped and reverse stamped all those different colours on each image, like a decal! This is such a cool and unique galaxy mani; love the pretty base as well. I love the fun figures over the galaxy base! Such a fun mani! <3 I hope you are able to get a little break from work soon. It's great that you have the space background. I'd probably do all stars on my nails since I love that shape. what a fun manicure you created!!! I've never seen stamping nail art before. What fun designs. I know my kids would love that design. I love nail polish and nail arts too! I will take a look and check this out so I can choose the shades I want. Thanks for the discount code. Need that plate!!! It’s so cute! How cool is that nail plate, it is amazing! I love the nail looks you have come up with by using it too. They are truly out of this world! LOL! They are super cute and fun...my nieces would love them. I love these. They came out great. I have not tried stamping on my nails yet but would like to. Wow I loved the nail art.. Never tried cute stamping plate.. Would love to try it sometime.. Such beautiful nails that are unique and one of a kind! This would be super fun to do on my nails. My boys would love to space theme. OMG!!! 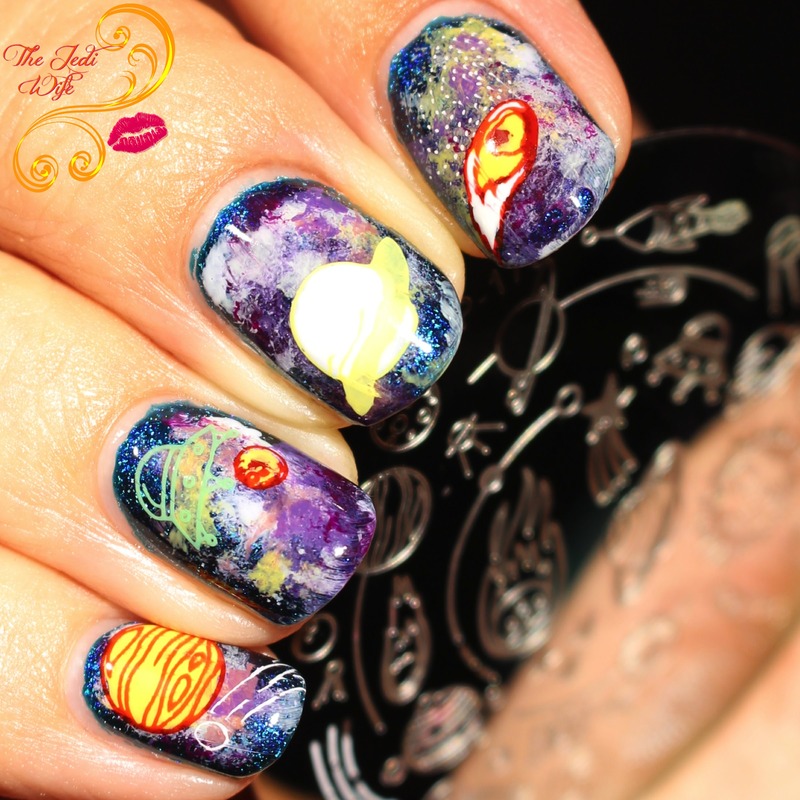 I’ve never seen anything like these galaxy nails!!! They are fire! 🔥🔥🔥 I will have to get this for me and my daughter; I know she would love it! Wow I love the detailing of these galaxy nails! 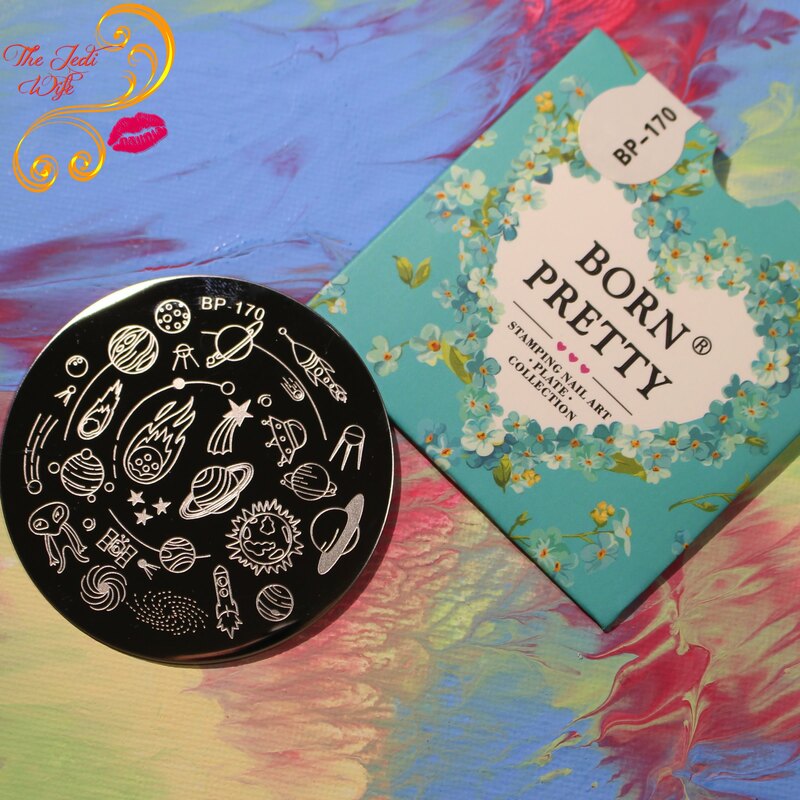 I used to buy nail products from Born Pretty loved the online store. This is very interesting. I like the combination of colors at the base. [Add blank stare here] How in the world can you do that? That is just too detailed for the space we have to work with. Do you have a video on how you actually performed these little designs? Oh my! That is so awesome and cool nails. I want to try this all. These nails definitely turned out amazing. I would love to have this design going on with mine! Your mani blows me away! I would also love to use this for a retro-colored reverse stamping mani. These nails look gorgeous. I love the art. I always love space nails! This is a cute plate for sure.